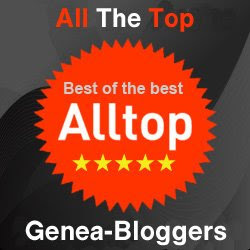 Shades Of The Departed will be highlighting those "Friday From The Collector" contributors who have been nominated in The Family Tree Magazine 40 Best Genealogy Blogs! Everyone's favorite The Chart Chick, Janet Hovorka has been nominated in the News/Resources category. Congratulations Janet, you're our "It Girl!" I'm going to start with one of the charts we have been showing at conferences this year, my current favorite. 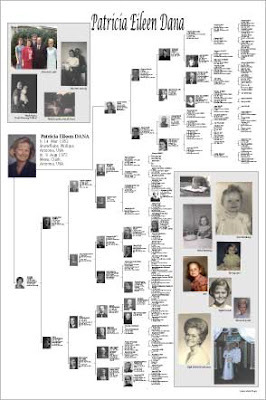 This is called an hourglass chart with ancestors on the top and descendants on the bottom. We do a lot of these at Christmas time. To the side on this one is a wedding picture, but you could put a group picture, or the home where this family lived. If you can imagine this chart without the pictures, it would not be nearly as engaging. We have done a few charts like this with even 100s of pictures. The more pictures, the more spectacular they are. But you don't need to have a ton of pictures to make a great chart. Even one picture can make a chart come alive. 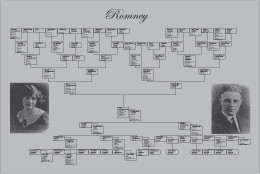 This is a simple pedigree that we have done often with a picture of the current family, or here with the patriarchal ancestor who brought the family name to America. 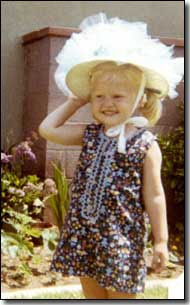 I particularly like this one for a child too. 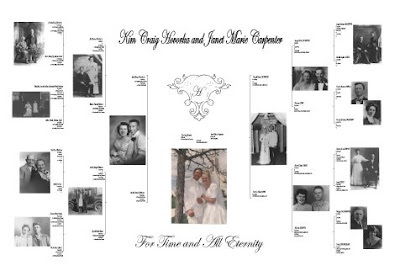 If you don't have a bunch of pictures for the hourglass above, pictures of the central couple work as well. One of my favorite charts that we did for family reunion season last year was this one. Luckily she gave me permission to share it. 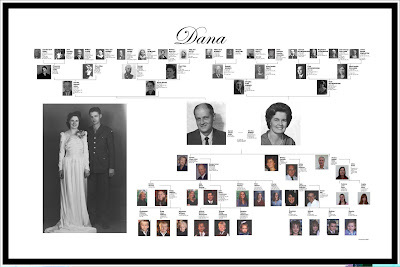 This lady focused on the family of 7 girls and one brother down the center right of this chart. To their right are the parents and grandparents. Then for each of the 8 children, she did a separate chart where she enlarged one of the 8 children, added that child's spouse(s) and then put their descendants to the left. She added wedding, group and house pictures at the bottom right for each family. The wonderful thing about these charts were that she had gone through and found pictures for each person in their early 20's. The 7 daughters all had these beautiful 1940's pictures so she added the art deco border and title to complement. It took her a month to collect photos for the descendants on all 8 charts, but she was thrilled with the attendance at the family reunion—everyone had to come see themselves and where they fit in. She wrote me afterward and expressed appreciation for the emotional healing she felt that this project had created in the family. 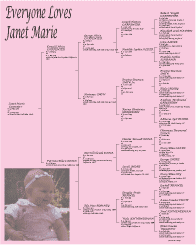 Another great descendancy chart we have permission to share is this Italian immigrant chart. This client wanted to produce a chart for the Italian part of the family that showed all the American cousins. He added a map, copy of the immigrant's birth certificate and a narrative about the miracle he experienced finding these cousins on a trip to Italy. Again, it took some effort to get all the descendants pictures but it was spectacular in the end. And here is another one where we have added some extra embellishment to bring the chart to life. 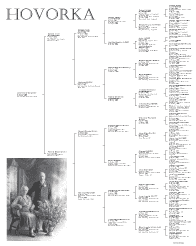 This is an ancestor chart with an amazing amount of ancestor pictures in with the data. But then on top we added some family pictures and on the bottom right a timeline of her life. We split the mother's line from the father's line to be able to break it up a little and fit it to a normal frame size. One of the new designs we are doing is a chart without all the vital information. Just focus on the good stuff—the pictures. The new timelines can be done lots of different ways. You can do the life span of one person, or all the children in a family. The one I have in my office is my matriarchal line. 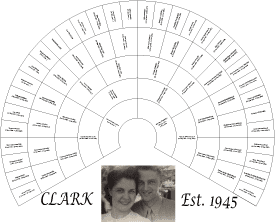 And a client gave us the idea for this one, a legacy chart. You can do this with vital statistics or more explanation. It would work for your famous ancestors or for your more infamous. I like it in this format with just the pictures again. These are beautiful unframed as stretched canvas giclees. 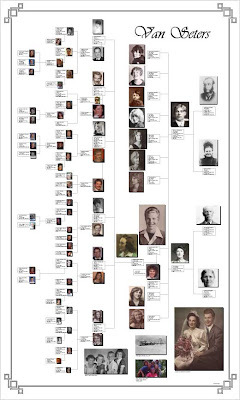 Then, there is also the whole perspective in the family timeline chart we have developed. You could do this lots of ways too. 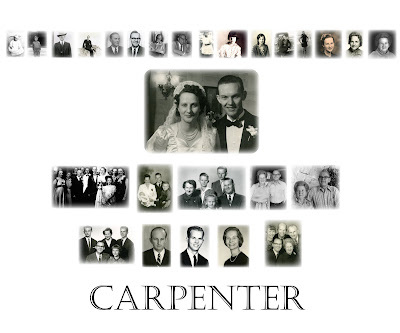 This one has the wedding picture in the center with parent timelines on top, and family group and individual pictures below. It all centers on that wedding picture because that is what created this family. And finally I'll end with my all-time favorite. This is the chart that hangs in our dining room, as a big beautiful framed canvas giclee. We call it a wedding chart, and I love how young and in love everyone is. As we have developed our company, I have been impressed with the impact of having your family history out in front of you every day. I find that it inspires me, helps me reach a little farther and work a little harder. It is good for me to be reminded of the span of a life, and the reach of a family. However you decide to do it, I would encourage you to get your family history out in front of you, where you and the people you live with can enjoy it. If you've seen something you just must have, please contact Janet at Generation Maps. You won't be disappointed.